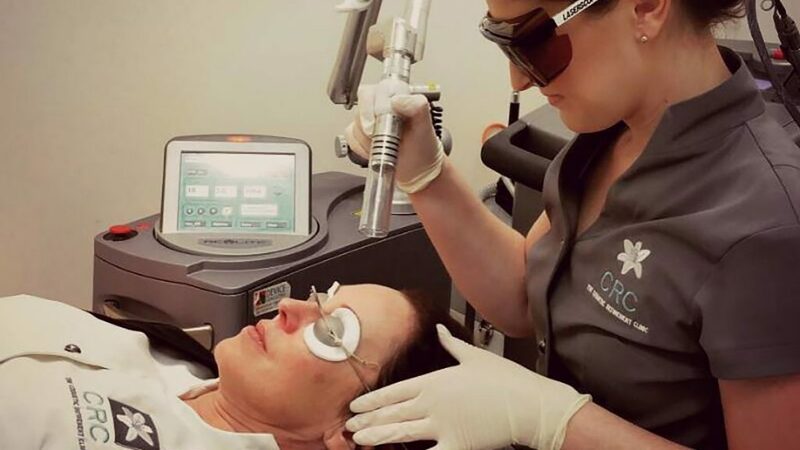 The Refine Laser Rejuvenation treatment is Dr. Niamh Corduff’s ‘go to’ treatment. Easily the clinic’s most popular treatment, it is a great procedure for skin rejuvenation, bringing instant life back into the skin. It is also popular as a pre-event pick-me-up, to assist with the longevity of applied make-up. The treatment itself is a quick and painless procedure that combines the benefits of laser therapy with an intensive skin treatment. This treatment only takes 30 minutes, so it can easily be performed during a lunch break for those who have a busy lifestyle. What’s involved with the Refine Laser Rejuvenation treatment? The laser component utilizes the latest Q-Switch laser technology with a PTP setting. This allows for a specific wavelength of light energy to be delivered into the skin, penetrating deep into the dermis and producing a mild thermal response. This results in the up-regulation of collagen production, consequently reducing the appearance of fine lines and providing instant life back into the skin. The texture of the skin appears smoother, the skin tone more even and there is a reduction in pore size. Following the laser component, a mild intensive skin treatment typically in the form of a mild lactic acid chemical peel is applied. This intensive skin treatment component stimulates skin cell turnover aiding in the removal of any dead skin cells sitting on the surface of the skin. It also assists in increasing the natural hydration factors in your skin, making your skin feel refreshed and bringing back its natural glow. Is the Refine Laser Rejuvenation treatment painful? The Refine Laser Rejuvenation Treatment can involve some mild discomfort. During the laser component of the treatment, a client may experience a mild ‘pin-pricking’ sensation, as well as some mild heat as the laser produces a mild thermal response. As the intensive skin treatment is applied, some clients may initially feel a mild ‘tingle’ sensation. This usually lasts for only a minute as the treatment penetrates the skin before becoming neutralised. This treatment is ideal for all skin types and for optimal results a course of three to six treatments at four-week intervals is required. Results are usually seen after one treatment. However, the more treatments a client has (like any advanced skin treatment) the better the results. Our signature Refine Laser Rejuvenation treatment has replaced those monthly facials as the results speak for themselves. How much does the Refine Laser Rejuvenation cost? One might read what our signature rejuvenation treatment involves and assume “Oh, this procedure must be expensive”. Not at all – this popular rejuvenation treatment only costs $149.00. Packages of three and six treatments are available, with savings of up to $100.00 (that’s nearly a full treatment for free).